Tin and copper holders have been showing up in the thrift stores and regular readers know I love stencilling. 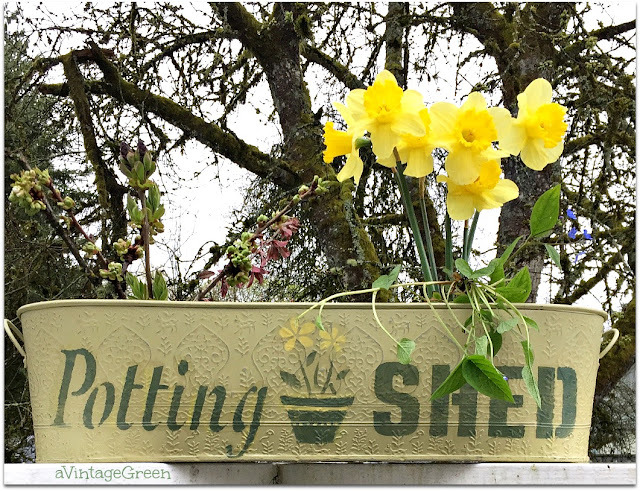 Always checking out what other bloggers are sharing - and stencilled plant holders are gracing front porches, table centers, mantel decorations and more. 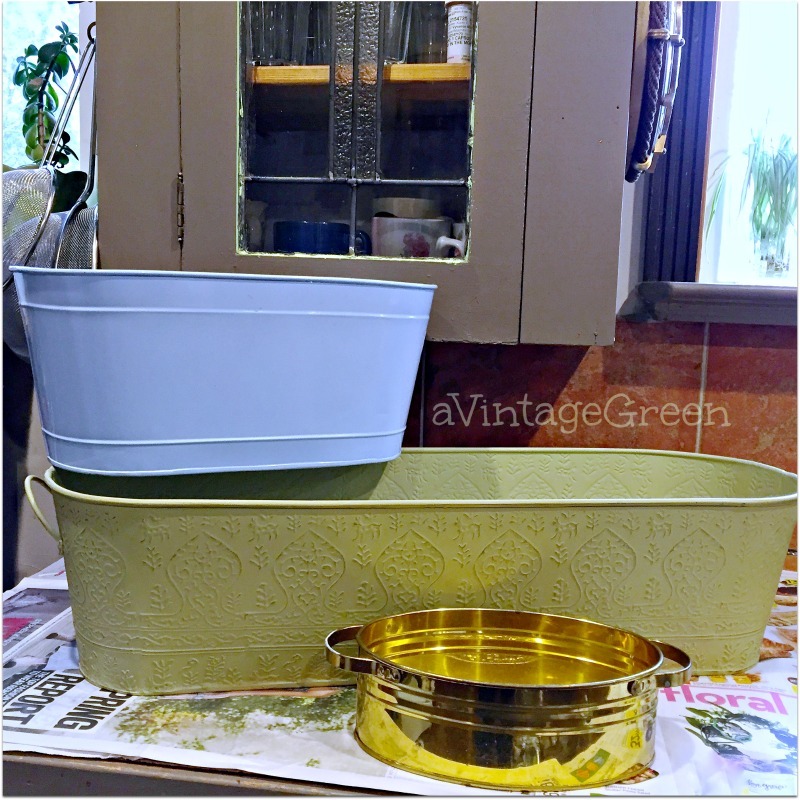 Found 3 (1) raised pattern, curved surface green tin (2) flat surface curved blue tin (3) small oval brass. Each was about $1.00. I had the stencils and paint supplies on hand so no 'new costs'. Curved and patterned surfaces are not as 'easy to stencil' as a flat board. Three hands and lots of tiny fingers to hold the stencil flat while adding the paint would have been very handy - but instead I used blue tape and held each letter as flat as possible while I ponced (added the paint, sponge by Martha Stewart). I did use a fine tip brush to clean up the edges that had bumpy lines plus add a yellow line on the plant pot. Used Michigan Pine by CeCe Caldwell and Fat Paint Tuscan Sun. A few daffodils were in my side garden so I picked 6, pulled up a few pieces of ground cover and clippings from a lilac, ornamental plum and cherry tree to add to the planter. It is important to use extra blue tape to hold a larger stencil in place when using a smaller area of that stencil. Used Annie Sloan Chalk Paint Napoleonic Blue. 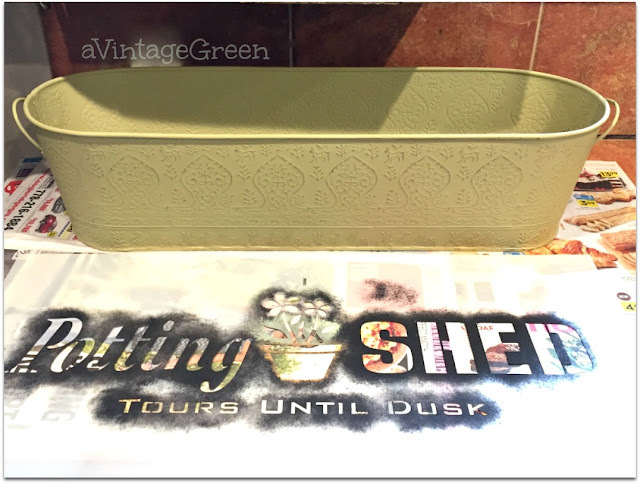 Having a stencil become loose when stencilling usually means it is time to wash off the paint and start again. I did that on my first try with the blue tin plant holder. 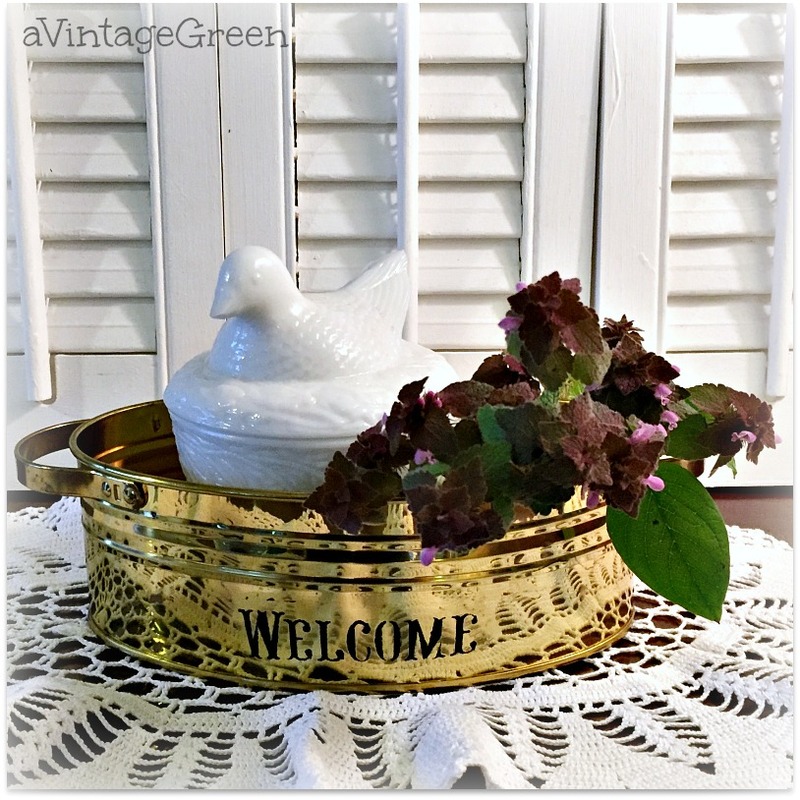 An oval brass FTD flower/plant holder with WELCOME added. 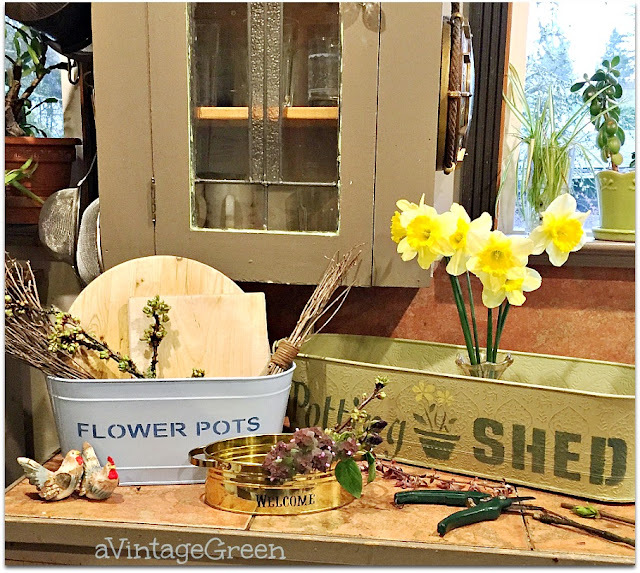 I used Folkart Peel and Stick Painting Stencils with CeCe Caldwell Beckly Coal Chalk-clay paint. Added some pink flowering garden ground cover and a white hen on a basket. Finished each stencil words on the planter with Fusion Tough Coat Sealer Clear (2 coats). It does show a bit shiny but better than the stencilled painted words washing off in the first rain. - paint (lightly x2) over letters with Fusion Tough Coat Sealer Clear to seal the paint. I picked up a Belle Fiore Teapot yesterday at the thrift store - very crazed inside and out - but no chips anywhere and added the teapot to the collection of planters. Evening photo. 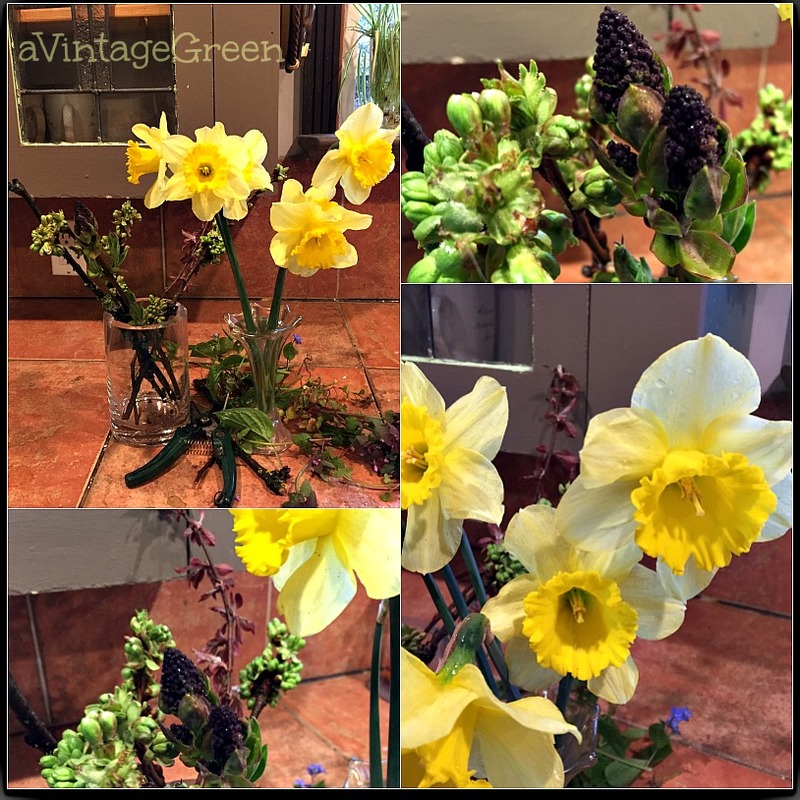 Joy, I see you making small flower arrangements. I have just discovered window sill art. I love the shine of the gold container. Have a great week. Sylvia D.
These look great Joy. I have a metal container I think would look great with a stencil, maybe I'll get brave and try it! 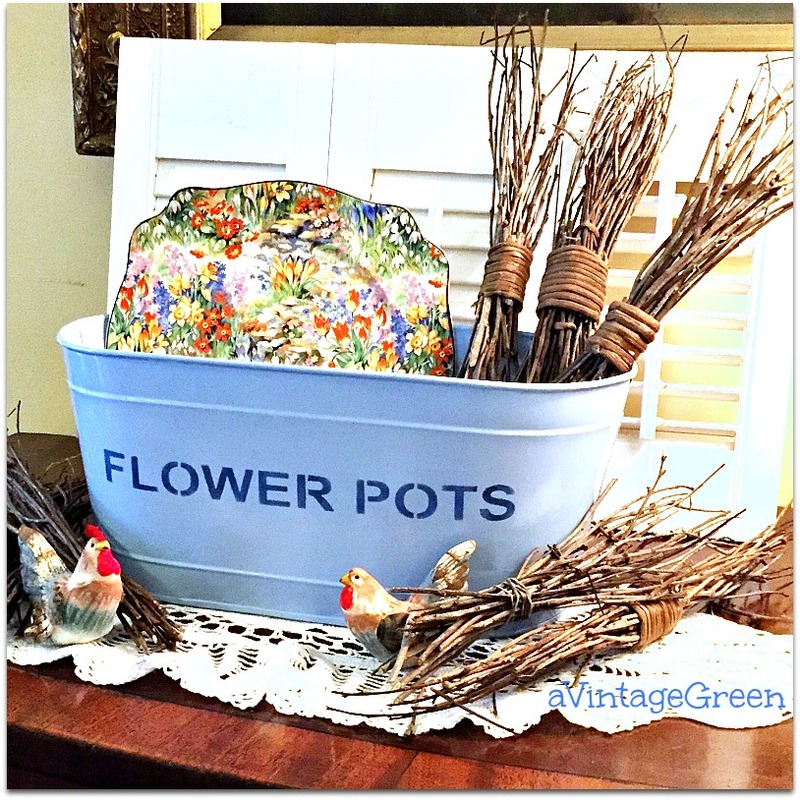 Love the stenciled pots Joy! 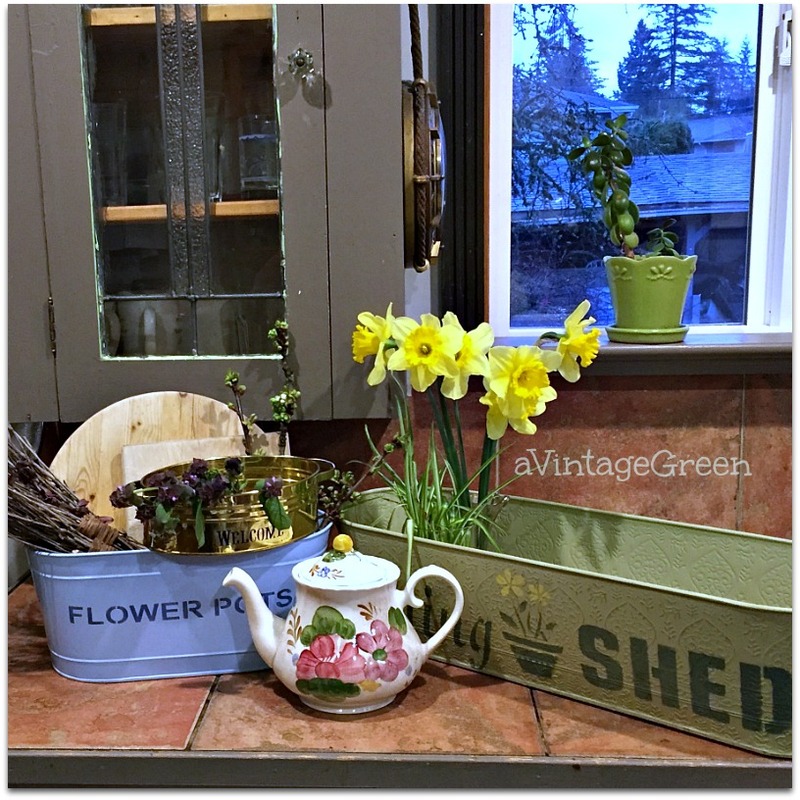 I really enjoy stenciling and I use blue tape to hold mine down as well. Thanks for sharing with SYC. They all turned out really cute. My favorite is the yellow with green words. They all look great! YOU are the Queen of Stenciling!! Great job, Joy. 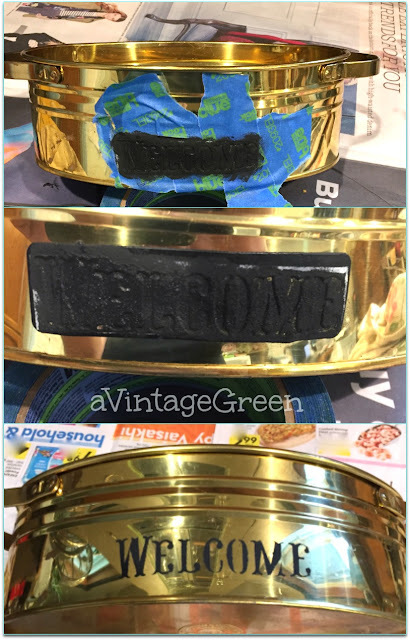 I have several old metal tubs out in the yard that I could stencil. Thanks for the tutorial ... may encourage me to try. Getting time is the issue. All of those containers look fantastic. I especially like the "Potting Shed" one. Nicely done! These are just lovely. You have inspired me to look for some nice planters to stencil. Thank you for sharing. These all turned out really cute! I am annoyed that I signed up to get your posts by email and I haven't gotten any even though when I tried to sign up again now it says I already am. Bummer! But that is why you haven't seen me. Sorry. I love each and everyone of the planters. 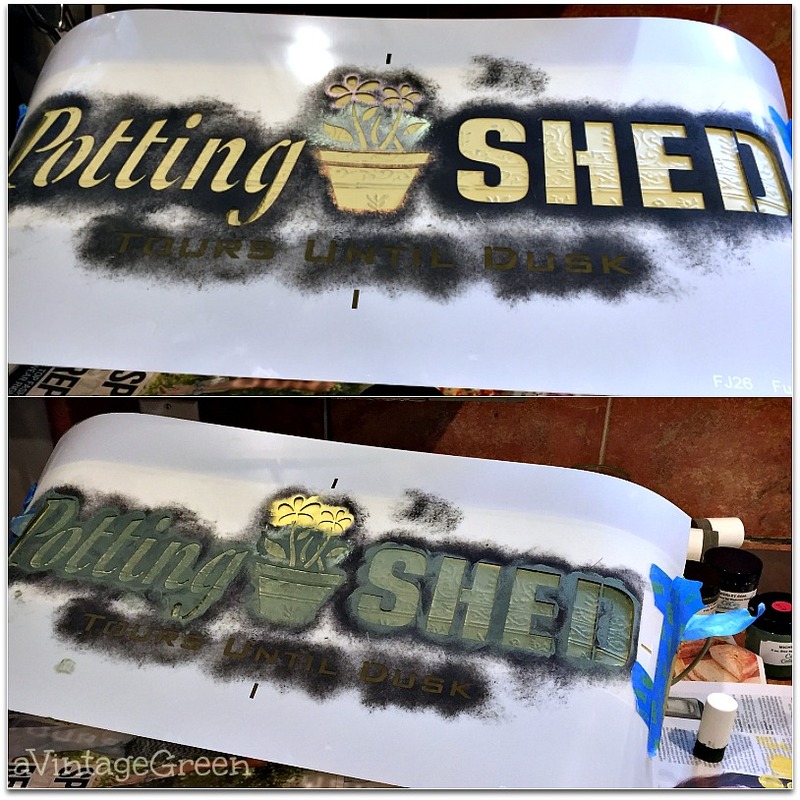 The potting shed stencil is my favorite. So cute. Looks terrific. I really need to pull out some stencils and get to work! Oh my goodness, I'm inspired! I have noticed metal tins at the thrift stores & now I know what I can do with them! I especially love the green textured one you did, but both are very sweet. You can bet I'll be on the lookout for some for me! I really like those oblong metal tins. I can't believe what a steal all three of those planters were, you're not just the Queen of Stencilling but also the Q of Bargain Hunting too!! Have a great week, I'll be over to see what treasures you found soon. Joy, these came out adorable. I always love all the stenciling you do. These turned out so beautiful! Thanks for sharing on To Grandma's House We Go! I love what you've done with these planters, Joy! They look fabulous. I'm featuring this at today's Snickerdoodle Party! Thanks for sharing with us! So cute. They look fantastic. Thanks for sharing at Keep In Touch.